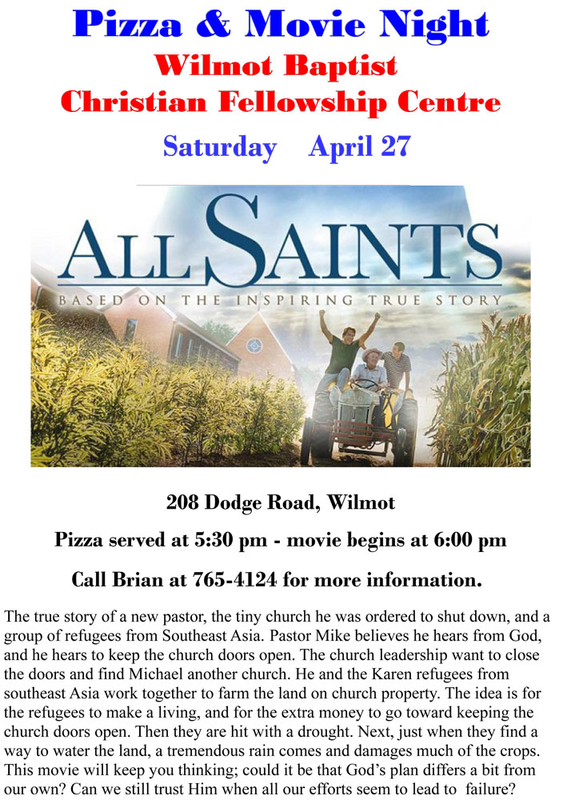 Wilmot Baptist presents "All Saints". Pizza served at 5:30pm. Movie starts at 6:00 pm. The true story of a new pastor, the tiny church he was ordered to shut down & a group of refugees from Southeast Asia. Pastor Mike hears from God to keep the church doors open & help the refugees. The church leadership want to close the doors and find Michael another church. He and the Karen refugees from southeast Asia work together to farm the land on church property. The idea is for the refugees to make a living, and for the extra money to go toward keeping the church doors open. Then they are hit with a drought. Just when they find a way to water the land, a tremendous rain storm comes and damages much of the crops. This movie will keep you thinking; could it be that God’s plans differ a bit from our own? Can we still trust Him when all our efforts seem to lead to failure?